Visibility by script allows you to set dynamic visibilities for form fields. You can define if certain fields should be required, editable, read-only or hidden, based on the value of another field or on a decision made. Flokzu.onAction(function) //Function is executed when a button is clicked (i.e. a decision is made). The value of the chosen button is stored on the second parameter. Flokzu.error( [[field]] , "message" ); //If the field generates an error, the corresponding message is shown. Field names and button names must be written exactly as they are, respecting the capital letters, lower case letters, spaces and special characters you have used. A visibility script is basically a group of functions that determines under which conditions the visibility of a field should be modified. In addition, each function should be subscribed to the field it wants to ‘listen’ to, so that when the field value changes, the function executes automatically. If a function must be executed immediately when a process instance is opened (e.g. to hide a field), it will also need to be subscribed to the method Flokzu.onInit. RULE: In order to modify the field visibility dynamically, the field whose visibility will change must have been set as editable in the process (for the task that has the script). On the contrary, when the field is modified, the visibility by script will not behave properly. 1) Write all necessary functions to set the dynamic visibility. 2) Subscribe all the functions to corresponding fields and/or the Start Event. Subscriptions must be below the definition of the function. Where to place the script? 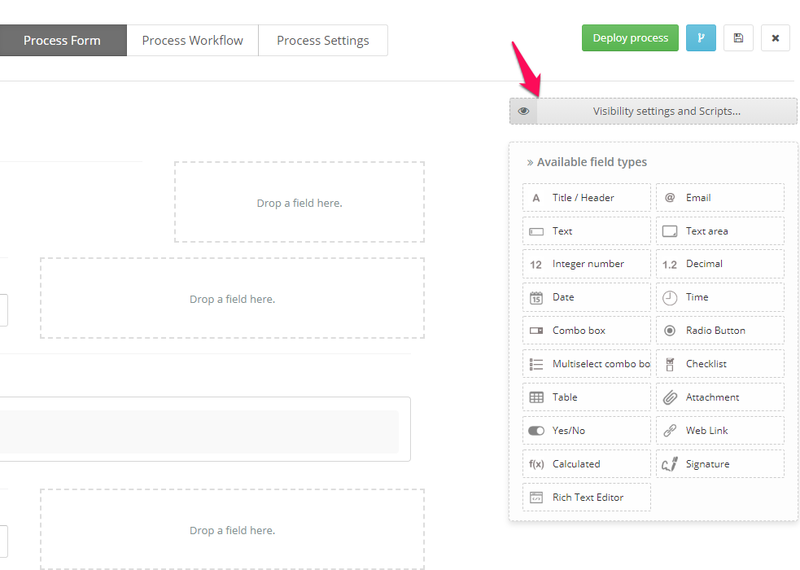 1) While creating or editing a process, clic on Visibility settings and Scripts button on the form tab. 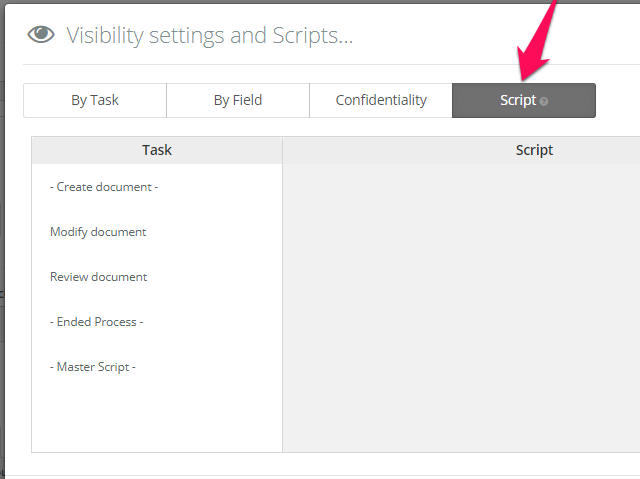 2) Once in the visibility pop-up, click on Scripts tab and then select the task in which you want the script to be executed. Finally, place the script there and Flokzu will make an evaluation, if everything is ok you&apos;ll be able to Continue if not, Flokzu will tell you where&apos;s the error. Scripts can be applied to the Start Event, Middle Tasks of a process or even, End States. 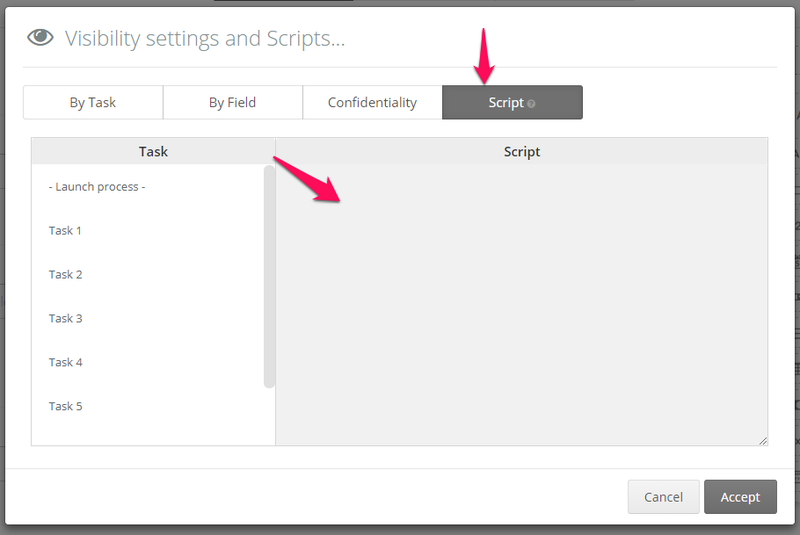 - Master script - The script defined in that option would be embed in all active tasks (not end states). This is totally useful when you have a behavior that must be applied in all tasks. In this example, we have a manual combo field called ‘Marital Status’ and when a user selects the option ‘Other’, the field ‘Please specify’ will be shown as required. On the contrary, this field will be hidden. //We must ‘listen’ to the field ‘Marital Status’ and when it changes, the function must be executed. //Given that the field ‘Marital Status’ will be editable (by RULE), we want that immediately after the process instance is opened, it remains hidden if the value is not “Other”. For this reason, the function must be subscribed to the Start Event. alert( $(this).attr(&apos;value&apos;) ); // Launches an alert per each value.